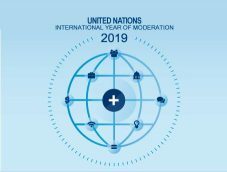 The International Year of Moderation 2019 (IYM2019) was declared in a UN General Assembly resolution in December 2017. It is one of three UN international years being observed in 2019 – the other two concerning Indigenous Languages (IYIL2019) and the Periodic Table (IYPT2019) – but so far the one getting the least attention. However, the IYM2019 observance does yet not appear to have as well-developed a public (social media) presence as the other two international years. I found only, on Facebook, a page entitled “2019 as the International Year of Moderation,” and an associated event from the beginning of the year (from which I found the image above). The slow start may be related to former PM Najib’s political and legal problems, and to the closure of the Global Movement of Moderates Foundation in mid-2018. Presumably these would have been prominent in organizing the IYM2019 observance. A personal comment: It seems that a year devoted to “moderation” might also, beyond the aims stated above, encourage discussion of moderation as a virtue in other ways. It is for example discussed in philosophy and religious teachings. But it also has very practical benefits, such as in resource use or habits relating to health. If observance of IYM for the rest of 2019 is too narrow in its conceptualization, an opportunity for wider learning would be missed.